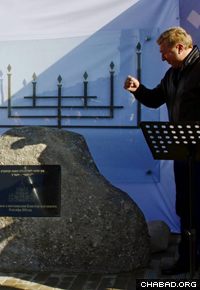 Rabbi David Shvedik addresses the groundbreaking ceremony for a new synagogue in Kaliningrad, Russia. More than six decades after Nazi forces and their sympathizers destroyed the New Synagogue of Koenigsberg during the Kristallnacht series of pogroms in November 1938, Jewish residents of the renamed city of Kaliningrad are planning to rebuild the 1896 edifice on the same spot where it once stood. Chabad-Lubavitch Rabbi David Shvedik, the Russian city’s chief rabbi, estimates that it will take two years to build the new facility. He already has plans to add a school, nursery and community center to the completed structure. And while city officials view the project in terms of granting the Jewish community a permanent place to pray and meet, locals such as Oxana Leschinskaya stress that for them, the synagogue means much more. Shvedik notes that the whole community is coming together to make the dream a reality. The current leased basement used by the community can accommodate only 500 people, he says, but the new synagogue will be able to serve 2,000. The new synagogue will be built on the site of the one destroyed during Kristallnacht in 1938. Judging by the turnout at a recent groundbreaking ceremony—which was attended by Mayor Alexander Yaroshuk and other representatives of federal and municipal authorities, diplomats and prominent public figures—the project enjoys support from the highest levels of local government. According to Leschinskaya, a frequent attendee of Shvedik’s weekly STARS class for young professionals, the ceremony made a huge impact on the community’s older members. Although a circus currently occupies the space where the synagogue will be built, Shvedik is optimistic that the new building will rise fairly quickly.